Brighton Pier- The first thing I did once we got settled in our Airbnb was to walk along the promenade that leads to the Brighton Pier. I started at the Brighton Bandstand, one of the best preserved Victorian bandstands still surviving in England. Then, I looked out to sea at the remains of the West Pier, the pier that was burned down in 2003, and it was eerily charming. 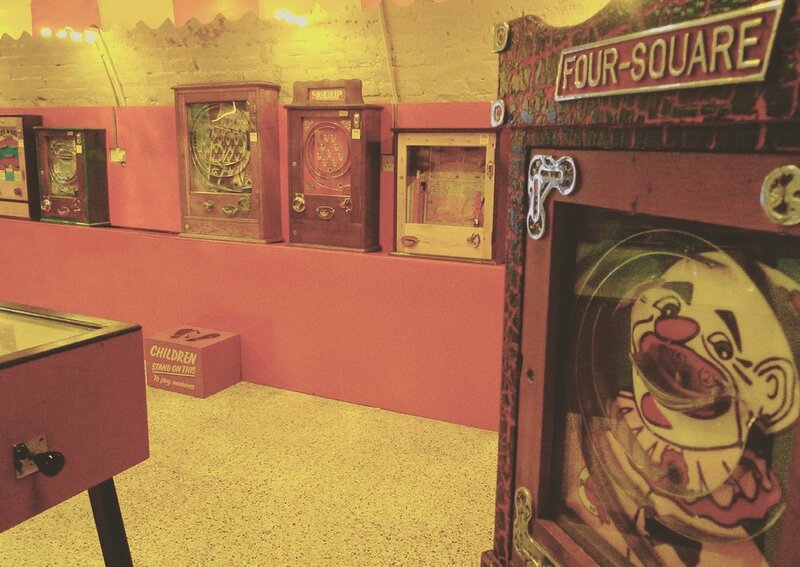 Next, I headed to the Mechanical Memories Museum, which is a super fun vintage penny machine arcade. Be careful when you put it in your google maps as there is a false address listed, and the sign no longer says Mechanical Memories, but it is easy to find if you just keep walking along the promenade before you get to Brighton Pier. On my way, I stopped at one of the many stands to get some cockles, and after playing some of the vintage games I ended at Brighton Palace Pier, which is a fun pier to walk down because of the history. My only wish was that people were dressed like they would have been during that era, but it was a lovely walk, and I used my imagination to feel what it would have been like in those days. The Royal Pavilion- This is truly an awe-inspiring pleasure palace! My favorite design element was the hand-painted one-of-a-kind wallpaper. This palace, built for King George IV, is filled with detailed beauty, and is unique for the time, taking it's inspiration from the visual styles of India and China. During your visit you should have a coffee or a tea at the Queen Adelaide Tearoom, which has a balcony where you can look out at the grounds of the palace, and look up at the architecture of the palace. They do not allow photos inside the palace, and I did not break the rules, but just know that the interior of every room in this palace is amazing. Detail from a mysterious stained glass window, housed in the Booth Museum, whose artist is unknown. Booth Museum of Natural History- This museum was opened by a private collector and naturalist, Edward Booth, in 1874. The collection is presented in Victorian style dioramas that attempt to recreate how birds would appear in the setting of their natural habitat. Booth's museum was the first to present it's collection in this way, and it influenced how other museums would present their animal displays. He donated the museum to the city in 1890 with the provision that the display of over 300 dioramas not be altered. Duke of York's Picture House- An art house cinema, opened in 1910, which lays claim to being the oldest cinema in continuous use in Britain. It is an amazing cinema filled with beautiful details from the past. I got a small popcorn and a glass of red wine, and took my seat after a brief chat with the friendly staff member. I watched a movie that I didn't love, so I won't name it, but it doesn't matter, because I enjoyed the experience of visiting the theater so much. They also have a cozy bar/cafe in the building. 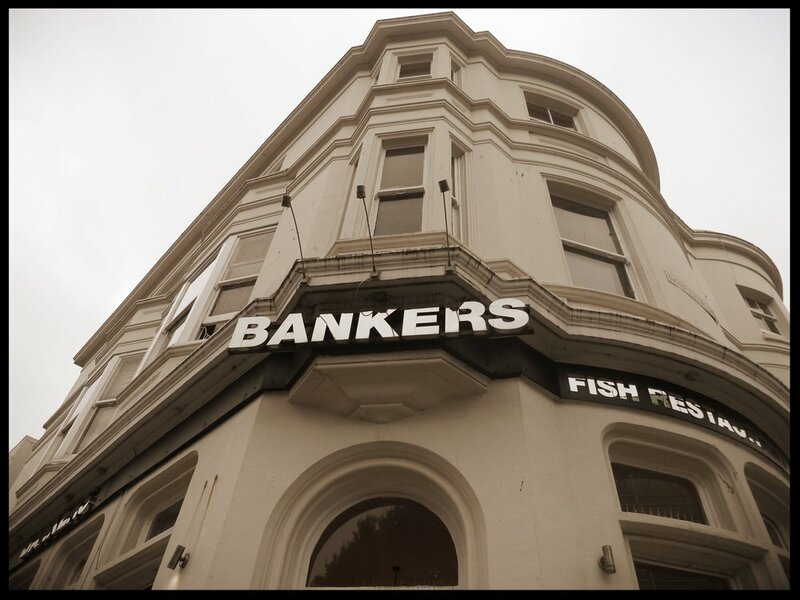 Bankers-This is the place our host recommended for fish and chips, we thought a local should know, and she did not lead us astray. We got our fish and chips with mushy peas to go, and it was crispy, fresh and traditional. Terre a Terre- When traveling around England, eating mostly Fish and Chips and savory pies, it was a real treat to have a delicious vegetarian meal at this fantastic restaurant. I highly recommend the sharing plate, which is beautifully presented, and is a great way to try many of the wonderful ways the chefs prepare the dishes. I was delighted that they serve bottles of wine from England, which I had never had before, and the one I chose from Sussex was very earthy and tasty. The service was impeccable, and the entire experience was terrific. Taj the Grocer- If you want to have a few snacks for your room, this is a fun International market to check out. We got some hummus, produce, and bread. The New Club- They dub themselves as an American diner, restaurant, cafe and bar. It didn't feel like an American diner to me, but that's not why I was going. It has a view of the sea, great service, good food, and cocktails! It's not as difficult to find cocktails in England, but after living in Spain for two years, I am always very happy to see them on the menu. I went there for brunch, I had a Bloody Maria (Bloody Mary with tequila), and Eggs Benedict , which I guess was created in America, but they do it all over the UK, and they do it well! The restaurant was super busy, but the service was still attentive and the food was served hot; the sign of a place that knows what it's doing. It was a wonderful way to start the day! Presuming Ed Coffeehouse- This is a perfect cafe! My latte was perfect, the atmosphere was perfect, the music was perfect, and the staff was perfect. If I lived in Brighton, I would be here all the time. Like with most cafes in Europe, this cafe also has beer for when you've had a few too many coffees, or if you just would rather have a beer. An extra bonus, is a small theater that plays Withnail and I, the movie that inspired the name of the coffeehouse. The Fortune of War- The oldest seafront bar in Brighton, opening in 1882, this is a great spot to sit outside and people watch. Many people from all walks of life were mingling at this bar, and you can see all the people walking along the promenade too. If you get bored of studying humans, you just have to look up, and you can gaze out at the sea. Marwood Bar & Coffeehouse- This cafe is wonderfully decorated, and being a sister spot to Presuming Ed Coffeehouse, once again they just get it right. The music, the staff, the latte, and the atmosphere was all on point. City Books- An independent bookshop with a wide variety of books, and a welcoming atmosphere. We found every book we wanted, and we had a great chat about Spain with the owner before we left the shop. It's the type of bookshop you wished every city came with, but I guess it wouldn't be as special. Brighton Flea Market- If I lived in Brighton, my entire home would be furnished by this vintage store's stock, but even if you can only buy what you can fit in a suitcase this fun shop still has some items for you. Branch- I stumbled upon this place, known as the postcard saloon, located inside Coastal Stamp Auctions. I walked down into the basement where the owner has over 100,000 postcards, and I was in love! It is an amazing find, and if you have any interest at all in postcards, I highly recommend you go, and tell him what you like. Vintage pinups, cityscapes, bulldogs, Brighton; you name it, and this store most likely has it. Quadrophenia- You must watch this cult classic film from the 60s where rival gangs, the mods and the rockers, head to Brighton Pier, and get into a little bit of trouble.